Super Mario: Blue Twilight DX is a non-profit unofficial fangame based on the Mario universe. 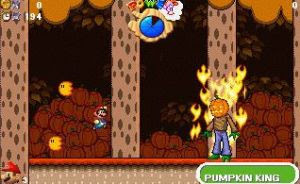 It combines elements from 3D Mario titles with classic, 2D gameplay, set in Halloween-themed levels. It was a cool night at the Mushroom Kingdom. It was the sort of calm that always fell over the castle after the defeat of the Koopa King, Bowser. Most people were in bed or heading there - as the day's celebration had tired everybody out. Even Mario and Princess Peach were on their way to their chambers for some much needed rest. Suddenly, the sky darkened as fog swept the land out of nowhere - and the moon turned red. A gust of wind blew out nearby candles. From the sky, came a winged gargoyle. With speed he swooped down, grabbing the Princess Peach tight in his claws - and shot off into the sky again; before Mario could even react. Unfortunately for Mario, there is no rest for the weary; he must save the Princess once again from the clutches of King Bowser! But was it really Bowser? Legend tells of a castle that appears only on Halloween night, filled with monsters and other strange demons. It's evil spreads across the land, turning the moon red. But such tales are only told to children, so that they fall asleep at night, right?